Sennheiser's vast range of headphones doesn't just include models for portable audio; the company has so many designs that they get divided into several categories. The 'Style' range consists of three models that not only look smart, but have apparently been tuned for neutral sound. This should make a welcome change from the usual boom-n-tizz of too much sound-on-the-go. 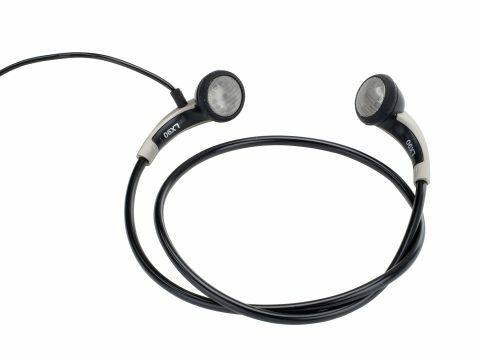 The company sent us all three Styles: the LX90 (£35) tested here, which has a clever springy headband, the MX90 (£40), which clips over each ear like a Bluetooth headset, and the OMX90 (£50) 'twist-to-fit' model. All three appear to use the same driver. Some differences will be down to the fit on individual ears, but we tried these on several listeners and came to a strong preference for the LX90 (which happens to be the only one not including a volume control in the lead). All three do indeed have an admirably neutral balance, but we felt the LX variant offered significantly clearer sound with a degree of resolution that really does justify the term 'hi-fi'. The MX and OMX seemed quite seriously boxed-in and congested, but the LX is more open and allows one to hear much deeper into the music. As seems invariably the way with in-ear 'phones, stereo imaging is less good than 'proper' headphones can create, but in the noisy outdoor world, that's hardly an issue anyway. Meanwhile, the unexaggerated treble makes MP3 artefacts much less noticeable than with many in-ear headphone designs.